Despite sharing the Iberian peninsula with one of the world's most visited countries, Portugal's lures are not widely known internationally. But whether you're looking for major cities full of rich culture, beautiful beaches for swimming, sunbathing or surfing, picturesque landscapes or top quality cuisine, you'll find it in Portugal. Port wine, usually just referred to as port, is undoubtedly Portugal's most famous export. But you haven't really drunk port until you've tried its myriad forms in Portugal. Visit Porto and tour the producers' cellars, where you will learn about how port is made and sample some of the most famous port varieties, or visit the Douro valley where the grapes are grown. Another great place to try port is at Lisbon's Solar da Vinho da Porto tasting room. Portugal's capital is teeming with culture and historical sights and has some great nightlife to suit all tastes. You can hop on the historic tram 28 which takes you past many sites and neighborhoods or wander around the medieval streets of Alfama. Admire the views of Lisbon from St. George's Castle or from one of the ​mirodouros (look-out points). Add to that the fact that Lisbon is probably the best-value Western European capital, and you have a top destination to suit all budgets. Porto is most famous for its port wine, but there is much more than the city has to offer. The Ribeirinha promenade, a historic waterfront area: Stop at a cafe or wine bar and take in the beautiful views along the river of Villa de Gaia, where all the port cellars are, and the Dom Luis I bridge. Southern Portugal's Algarve region has an amazing coastline with stunning beaches, beautiful waters, and striking cliffs with hidden coves. You can find whatever type of beach you are looking for, whether for swimming or sunbathing, secluded or full of fellow sun worshippers. The beaches in the most southwestern point, such as Sagres, provide great surfing conditions. Can't make it to the Algarve? 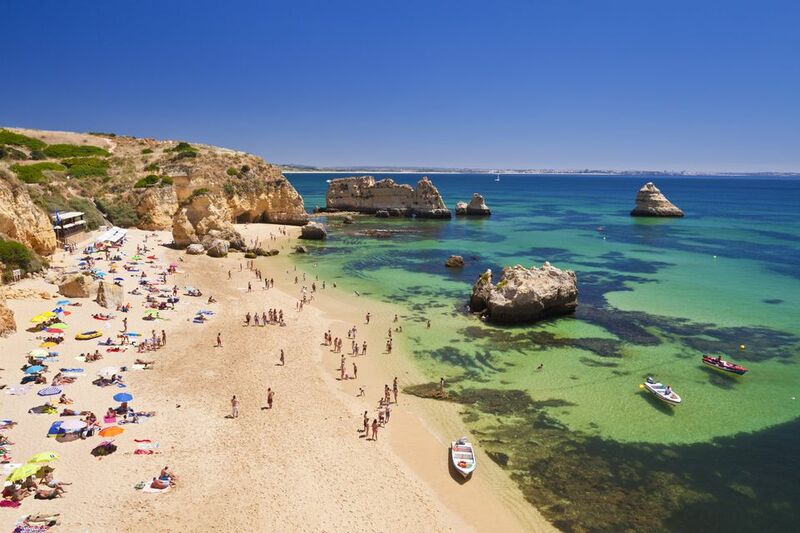 Not too far from Lisbon is one of the most beautiful beaches in Europe, the Praia da Adraga. The Douro Valley is where most of the wineries producing port are actually located, even though Porto is where the wine is aged, bottled, and stored. This is is the oldest demarcated wine region in the world. Even if you have no interest in port or its production process, it is worth a visit to the Douro valley for its scenery alone. Picture rolling vineyards, lush backroads to cruise, and open blue sky. Bom Jesus do Monte is a religious sanctuary just outside of Braga, about an hour from Porto. Perched on top of a hill is a church and gardens, which you can either take the funicular up to or walk up the amazing zig-zagging staircase. Take the funicular up to the top and walk down the stairs since each landing has something interesting to see. Sintra is one of the most popular day trips from Lisbon where you can visit three palaces (Regaleira, Pena, and Royal Palaces) as well as the Moorish Castle. Then stroll along the historic center, relax at the waterfront, or explore its nature parks. If you are trying to pack many sights in, consider booking one of the many organized day trips from Lisbon to Sintra. The trips typically include some time in Sintra as well as a visit to Cabo de Roca, continental Europe's most westerly point, and other points along the beautiful Estoril Coast. The Mosteiro dos Jeronimos is an incredibly ornate monastery in Lisbon's Belem district. Built in the 16th-century, the extraordinary work of architecture was designated as a UNESCO World Heritage Site in the 1980s. Today, you can freely explore the monastery, including its altar, cloister, refectory and more. Admission is 10 Euro as of March 2019, with discounts for children, students, and Portugal residents. Belém is one of Lisbon's most popular neighborhoods for exploration, so why not get a bird's eye view over the city too? You can if you're willing to climb to the top of Belém Tower (also called the Tower of St. Vincent). The 16th-century fortified tower is a UNESCO World Heritage Site and a famous landmark within the city. Tickets are 6 Euros, but if you purchase a Lisbon card during your exploration of the city, admission is free. Billed as the largest indoor aquarium in Europe, the Oceanario de Lisboa opened in 1998. The main aquarium holds more than five million liters of water, which all combine to showcase four different marine habitats. In addition to fish, the aquarium also houses mammals, birds, and amphibians. Matosinhos Beach is the largest beach with easy access from Porto—just a 15-minute subway ride away. Here, you can surf, sunbathe, or go for a swim. Given the influence of the Atlantic Ocean, the water can be quite cold, even during the summer months, but it still is a great way to pass a sunny afternoon. Equipment for surfing, like boards and wetsuits, can be rented from vendors on the beach. If you make it out to the Azores, a tiny chain of islands off the coast of Portugal, you'd be remiss to skip Furnas, adjacent to three spectacular caldera lakes. In addition to the area's geothermal pools (which are warm year-round), the scenic lake is ideal for hiking, canoeing, and other outdoor activities. Calouste Gulbenkian founded this incredible museum as part of his last will. The wide-ranging collection includes everything from European illuminated manuscripts to Greco-Roman art and Hermitage paintings. The museum also houses special exhibits highlighting the unique pieces from Gulbenkian's collections. Evora, located in Portugal's Alentejo region, is home to the namesake Roman temple, also called the Temple of Diana. The ruins are in remarkably good shape given their age and showcase an incredible contrast to the town's traditional Portuguese architecture. You can also visit the Igreja de São Francisco, home to the skeleton-filled Chapel of Bones. Located a short drive from Lisbon in the town of Mafra, the Mosteiro Palacio Nacional is a stunning monumental Baroque landmark. Built in the early 18th century, the palace includes more than 1,200 rooms. Many are incredibly opulent, with marble and gold details. Amarante is a picturesque riverside town that's become famous for a very, ahem, unique pastry. In this conservative town, you'll spot bolos (or cakes) shaped like a distinctive part of the male anatomy. The tradition dates back to pre-Pagan fertility rituals but has held strong today. This rugged stretch of Portugal is also the westernmost point of mainland Europe. If you're near Sintra or Cascais, you can walk the windswept cliffs and a make a short visit to the adjacent lighthouse. Visitors from the West Coast of the U.S. will be struck by how similar the landscape is to California's coastline. Rio Formosa became a national park in 1987. Now, it's a labyrinth of islands, canals, lagoons, swamps, and marshes, loaded with fascinating plant and animal life. Don't skip the Environmental Education Centre of Marim, which will acquaint you with the park's many ecosystems along with the creatures who call it home. Beyond that, there are plenty of other hiking trails, beaches, and places to explore. Serralves is one of Portugal's most important cultural institutions, consisting of a contemporary art museum, a park, and a villa. Exhibitions frequently change, showcasing work from innovative Portuguese artists and world-class modern giants like Joan Miró and Robert Mapplethorpe.